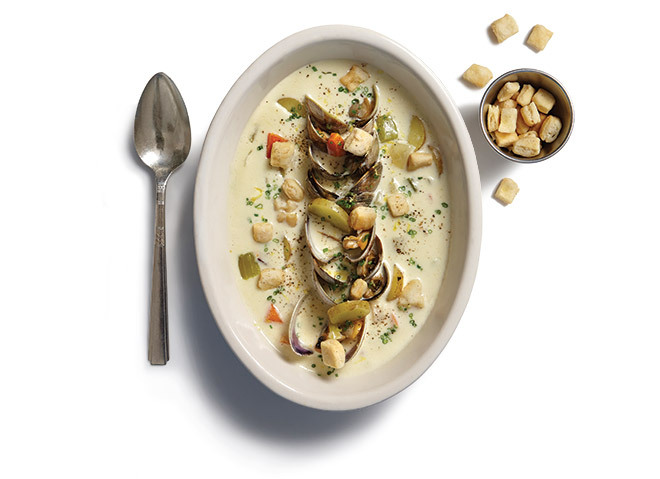 There are plenty of versions of chowder in Los Angeles—many of them as gooey as paste. For years finding a more authentic taste of New England meant visiting downtown’s Water Grill or Hollywood’s Hungry Cat (the latter now serves chowder only at its Santa Monica location). More recently Silver Lake’s L&E Oyster Bar has been dishing out hearty bowls of the stuff, while Kuniko Yagi and David Myers of Century City’s Hinoki & the Bird have been spiking their delicate version with miso and parsley jus. Now two new seafood “shacks” have upped the ante. Michael Cimarusti serves a flight of three chowders at his breezy West Hollywood bistro, Connie & Ted’s: creamy New England, tomato-based Manhattan, and a clear, brothy ode to Rhode Island. For the Rhode Island, Cimarusti, who grew up in New Jersey and spent summers in Narragansett, uses only potatoes, salt pork, clam broth, and middleneck clams. Chowder is tricky, Cimarusti notes, and not just because the bivalves are “wet little beasts” that must be dropped in at the last moment. “The biggest pitfall is the temptation to add a whole bunch of stuff,” he says. Connie & Ted’s, 8171 Santa Monica Blvd., West Hollywood, 323-848-2722 or connieandteds.com. Fishing with Dynamite,1148 Manhattan Ave., Manhattan Beach, 310-893-6299 or eatfwd.com. Hinoki & The Bird, 10 W. Century Dr., Century City, 310-552-1200 or hinokiandthebird.com. L&E Oyster Bar, 1637 Silver Lake Blvd., Silver Lake, 323-660-2255 or leoysterbar.com.